His rules included having a sense of humour and being willing to compromise and see things from the enemy’s point of view. The book is said to have inspired a young Barack Obama in his days as an organizer on Chicago’s South Side, and Hillary Clinton famously wrote her senior thesis on “the Alinsky model”. On becoming First Lady, she had Wellesley College change its regulations so the press couldn’t read it. 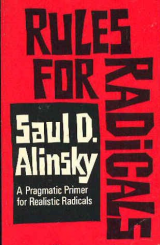 Clinton of course has long been de-radicalised, but the Alinsky name remains a byword for grassroots change. Wikimedia/Lucinda Douglas-Menzies.Berlin’s essay was groundbreaking, because in the 1950s the dominant view was that the various forms of socialism and communism had served to “liberate” oppressed peoples. Berlin, whose well-off timber merchant father had pulled his family out of Russia just after the Bolshevik Revolution and fled to England, had no such illusions. He wondered why those on the left in the United States and Britain hailed the new socialist states of the Soviet Union and in the East while turning a blind eye to the decimation of personal freedom that were a part of those regimes. Berlin defines “negative” liberty as freedom from something (coercion or interference), while “positive” liberty is the freedom to be someone or something. The problem with positive liberty is that there may be situations where I believe it is justified to coerce others to take steps that will lead to greater public health, or education, or justice. After all, I am just acting for their own good. Yet this view provides a licence to “bully, oppress, torture individuals in the name, and on behalf, of their ‘real’ selves”. Berlin was careful to note that he was not against all social and political movements that seek to improve the lot of mankind. He applauded them. What he was against was “the belief that some single formula can in principle be found whereby all the diverse ends of men can be harmoniously realised”. Such “single formulas” usually led to illiberal or nasty outcomes. Today, seekers of social justice must be prepared to defend themselves against Berlin-style objections about individual freedoms – no matter how compelling (in their eyes) the case for reform. The French Revolution caught the imagination of England’s thinking classes, stirring calls for political change. Man of letters Edmund Burke was considered a liberal and had supported the American colonies in their fight for independence. So his attack on the French revolutionaries came as a shock. Burke’s interpretation of 1789 became a classic statement of modern conservatism and a warning against the overpowering of any country by godless rationalists. He was the first to say that the excitement of revolution inevitably gives way to abuses of person and property. Liberty and equality sound good, but if they are taken suddenly and by force, what is the cost? Revolutions always claim to be new beginnings for “the people,” but the price of destroying old institutions is instability and vulnerability to despots. Like Aristotle, Burke believed that societal stability rested on property ownership and a large middle class, and he was horrified by the looting of private and church property. Burke was vindicated by the Revolutionary Tribunal’s bloody zeal, seeking to finish off all who were perceived as “enemies of the state”, and his analysis was borne out by the way various communist revolutions from Stalinism to Maoism ended in a brutal fashion. 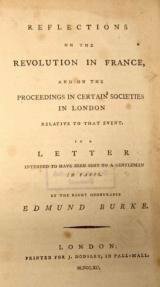 Every radical must have a good answer to Burke’s question: what happens after the revolution? First edition cover, Houghton MifflinIn the 1950s and 1960s nature conservation was a side issue. Most people were on the side of farmers who were, after all, in a fight against nature to feed the world. Chemicals were the future. But when, in the pages of Carson’s book, they read about food chain contamination, the wiping out of familiar birds and animals, and evidence that crop spraying could be causing cancer, what we now call environmentalism was suddenly a mainstream issue. 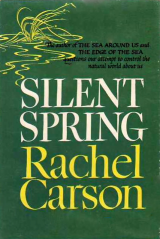 Silent Spring marked the point when the environment became a political matter. When John F Kennedy’s Science Advisory Committee validated the book’s conclusions, it was a step towards America’s 1972 ban of DDT for agricultural use, in the face of public relations efforts from agricultural and chemical companies. Carson was one of the first to argue that Earth’s environment is a complex, holistic system that needs to be revered and respected. After her death would come the Clean Air and Water Acts, and the establishment of the Environmental Protection Agency. For those wishing to challenge the system, Carson’s book is a lesson that, to be credible, ideas have to rest on solid, new, and preferably scientific, information. For instance, the big effect that The Spirit Level (by British epidemiologists Kate Pickett and Richard Wilkinson) had on the inequality debate was thanks to exhaustive compilation and cross-referencing of studies in income and health. Today’s radicals need to be driven by data. 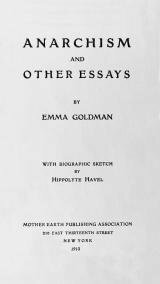 Though on the surface Goldman’s life was devoted to highlighting the dark side of the American Dream, in fact her political philosophy was universal, shaped by anarchist thinkers and activists including Pierre-Joseph Proudhon (famous for the line, “property is theft”), and Mikhail Bakunin. She had no faith in democracy to achieve social justice, and saw conventional politics as the playpen of the rich and powerful. Her vision of a society based on the fulfilment of the individual, her emphasis on love over marriage, and her highlighting of the dehumanising effects of capitalism continue to resonate. But as a person what people love about Goldman is her authenticity and her willingness to be jailed, attacked and abused throughout her life (she was called ‘the most dangerous woman in America’) for her beliefs. The usual argument against anarchism is that it goes against the human wish for organisation and hierarchy, and so would be hard to implement. Goldman never gave prescriptions for how it might work in practice, saying that each situation was different. The only time she felt at home was the brief period spent living in a self-governing anarchist collective in Spain. Today’s radicals are inspired by Goldman’s commitment, but they should not forget the need for concrete plans for change either. 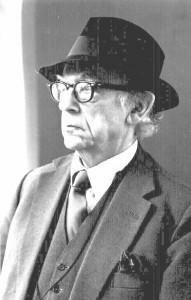 Saul Alinsky was right: even radicals need some rules. Tom is the author of 50 Political Classics.